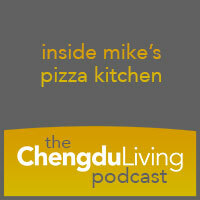 In this episode of the podcast, we speak to Mike of Mike’s Pizza Kitchen and get an inside look into Chengdu’s most beloved expat eatery. It’s safe to say if you live in Chengdu, you have probably interacted with Mike, the pizza-tossing maven responsible for Chengdu’s finest pizzas. And if you’ve interacted with Mike, I’m willing to bet you have a opinion of him. Whether on Internet forums, on the phone, or in person, Mike seems to leave an impression on people. His pizza business – which started as a delivery-only operation run out of an apartment and now supports a brick and mortar establishment – is without a doubt a great success, but it’s not without its detractors. Mike has faced accusations online of being rude and short of temper. Others have told stories online of personally witnessing outbursts. And if you were only to read his website in full – a website that sports a 2,500+ word FAQ section – you might think the man was slightly deranged, if not also a sort of brilliant writer. But we know few people who could tell me they’ve sat down and had coffee with the man and heard his side of things. Tired of hearsay and snippets and stories, we arranged a meeting with Chengdu’s pizza patriarch to talk pizza, fairy tales, police, and principles. 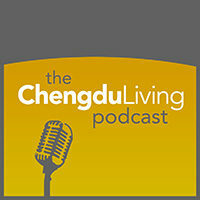 If you have a opinion on the man, his pizza, or the state of Western cuisine in Chengdu, this one’s for you. Mike sounds like a real dude. Informative and interesting podcast. Looks like I’ll have to give his pizza a try sometime. Also, had an idea for a sandwich called the Grumpy Businessman. It could have whitefish and smoked salmon with capers and onions. 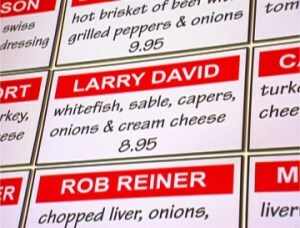 Sounds like you’re talking about the Larry David! I like your taste in sandwiches my friend! Was hoping someone would catch the reference. I forgot the cream cheese though. First, thanks for putting these Podcast together. I don’t want to come across as being mean, but I would like to make two comments about the Mike’s Pizza Kitchen podcast. 1. Please shorten your questions down to one or two sentences. Your interviewee is ready to answer and you are still rambling on. 2. Let the people talk. If they are explaining something, no need to finish the person’s comment for them. Hey Daryl, thanks for the honest feedback. Believe me, as I was editing this recording I found many moments where I wish I had just shut up and let Mike talk! To be completely frank, I’m fairly new to this and I’m becoming very familiar with what I need to work on. I really appreciate you listening to the podcast and hope you continue to listen as we improve these and other aspects of the podcast. But! If I may offer one counterpoint: we’re trying to have conversations, not strict interviews. A strict question-answer format can stifle the mood. I will readily admit that I talked too much, but we’re shooting for something more like a conversation than an interview, if that makes sense. Thanks for the feedback, Daryl. We’re working hard to improve in many areas. It turns out (we are learning) that recording good podcasts is pretty difficult. Thank you for listening. A jerk who makes good pizza is still a jerk. Running a business here as a foreigner has a very unique set of challenges and it’s real hard (impossible) to keep a cool head. Personally I wouldn’t manage situations with my employees the same, but if it works and fits in with Mike’s devil-may-care persona then so be it. What I thought was most interesting is how the logistics of the pizza ingredients (like the flour for the dough) is such a challenge. It’s a problem we face regularly and we don’t even work in the food industry. Comforting to know that no matter the small business, consistency and quality in supply are tough challenges. You didn’t even listen to the interview, jerk. I am a regular delivery and occasional pick-up customer of MPK. The first time I walked into the Kitchen to pick up my pizza, I saw a guy flipping doughs in the air. I didn’t think it’s Mike himself, but maybe his younger brother haha! It’s a great and very hardworking team there at the MPK. I hope you continue to be more and more successful. I’m excited by the addition of Johnny5 Donuts next door. Great food and team there too. Will try Redbeard soon. That is Mike. He’s there everyday flipping pizza dough. He is amazingly committed to his craft. Hearing about his inspiration within the pizza world (Lucali’s and Di Fara, NYC) illuminated a lot for me about why he works the way he does. My first thought was, why not just train people to do what you do, expand, and reap the profit? It turns out that this is not in the pizza code of excellence, which I knew nothing about until this conversation. My wife in Chengdu convinced her parents to buy a little oven and made pizza for her extended family for Spring Festival. I think she blew their minds. Well, I’ll have to try Mike’s pizza one of these times when I’m in Chengdu. Try it, I think you will enjoy it. I also recently got an oven through a great deal on the forum. It’s turned out to be an amazing purchase and something that I use 3-5 times a week. Mike and Aiqing! Keep doing what you are doing, great stuff! But please take a break and come see us in Bangkok!!! We miss you! Got plenty of stories here to tell you. 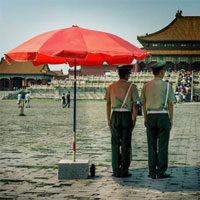 We do miss Chengdu, but getting a visa to visit for a few nights is keeping us here. Much love and nice interview….we listened to the whole thing last night!